Waterfront Park, an 8 acre park, received the 2007 Landmark Award from the American Society of Landscape Architects and the National Trust for Historic Preservation; this is due to its unique, and original, architecture. The park also serves as a point of interest for the Charleston community. In 1975 Mayor Joseph Riley Jr. was elected. He desired for Charleston to have a park; land acquisition began in 1979. Almost a decade later, Ruscon Construction Co. broke ground on the dedicated space. Work on the park continued until the opening date of May 11, 1990. Hurricane Hugo, which struck in September 1989, set the opening date back by only one week, but did bring the construction cost up by 1 Million to $13 Million. The park was designed by Sasaki Associates, led by Stuart Dawson, with assistance from Edward Pinckney Associates. The park has a floating dock that provides amazing views of Ravenel Bridge at sunset. The floating dock also provides views of Charleston Harbor, Castle Pinckney, Fort Sumter, and U.S.S. Yorktown. 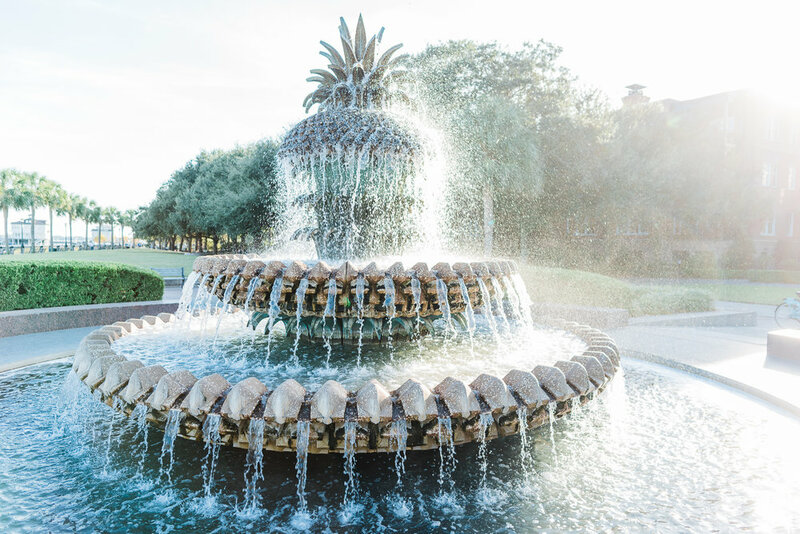 Waterfront Park, home to the famous Pineapple Fountain, contains several palm trees along the water; there are also oak trees that provide shade for benches, which visitors enjoy sitting on. I enjoyed watching people from the benches for a few minutes. I also enjoyed watching sailboats on the water, and viewing the palm trees, while standing at the Pineapple Fountain. The park would be a great place to sit and enjoy the breeze during the late summer. I will be returning to Waterfront Park on my next visit to Charleston. I would highly recommend visiting.